The country’s private sector borrowed less last year as the economy slowed down amidst a tight monetary policy whilst the Central Bank expects an upturn in 2018 with the business community carving a greater appetite for bank lending. Private sector credit expanded by Rs. 617 billion or 18% in 2017 though the rate of growth slowed down compared to 26% in 2016. The volume of private sector borrowing was down by Rs. 137 billion in 2017. Conversely, in 2016 private sector borrowing rose by 22% Rs. 756 billion. The Central Bank said the year-on-year credit to the private sector decelerated to 14.7% in December 2017 from 21.9% at end 2016 with average growth being 18.3% in 2017 compared to 25.9% in 2016. The Central Bank said credit to agriculture, industry and services slowed in 2017 whilst growth in personal loans and advances rose. Citing the dip in 2017 to tighter monetary policy, the Central Bank however expects private sector credit growth to increase by Rs. 650 billion this year. 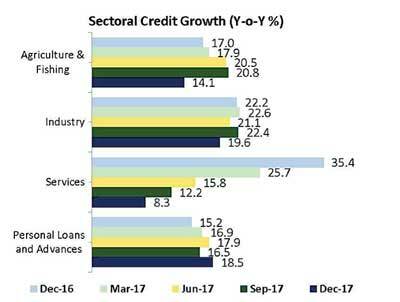 In 2016 credit extended to the private sector by commercial banks expanded, although there was a deceleration in year-on-year growth amidst tight monetary policy measures and the effect of the high base. With aggressive marketing campaigns by commercial banks and ample availability of funds as well as market expectations of upward adjustments in the government tax structure, credit to the private sector continued to accelerate during 2016 in spite of the upward adjustment in market interest rates in response to the monetary tightening measures of the Central Bank. 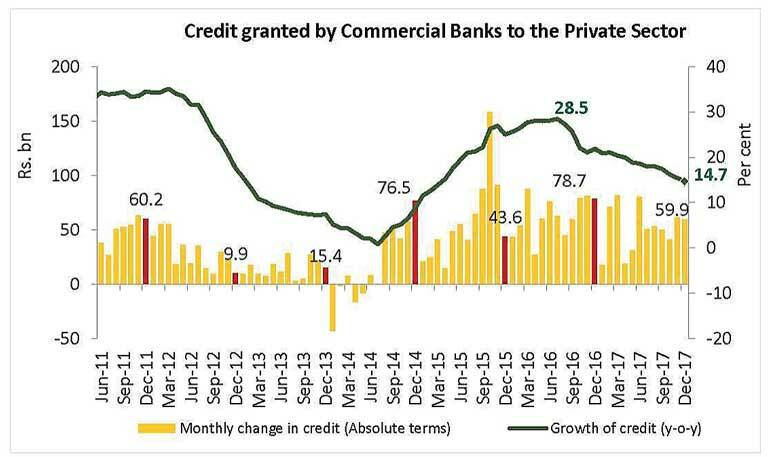 The acceleration observed in credit to the private sector in 2015 persisted in 2016, recording a peak growth of 28.5%, on a year-on-year basis, by end July 2016. However, the year-on-year growth of credit to the private sector moderated towards the latter part of 2016, and recorded a growth of 21.9% by end-2016, compared to 25.1% at end-2015, reflecting the impact of tight monetary policy measures and the high base. As per the Security-wise Analysis of Advances in 2016, the cumulative increase in credit against Immovable Property, Plant and Machinery; Personal Guarantees and Promissory Notes; and Other Securities, which include corporate guarantees, indemnities and staff loans, etc. contributed around 68% to the overall expansion in advances during the year. Reflecting the impact of the measures adopted by the Government and the Central Bank to curb excessive demand for motor vehicles, the expansion in credit against leasing and hire purchase agreements was substantially lower during 2016 compared to the previous year. Following its February 2018 monetary policy review, the Central Bank noted that the economy was currently operating at a level below its potential. Nevertheless, as per the available indicators, the economy is likely to recover from the effects of adverse weather conditions in the past two years and benefit from the expected boost in external demand and foreign direct investment inflows. Improvements on the trade front, including the execution of new trade agreements supported by increased private investment driven by structural reforms, are also likely to provide the necessary impetus for the economy to achieve its potential in the medium term.